Meet the Team at K S Driving School. The expertise to help you become a safe and confident driver quickly, reasonable prices and stress-free. 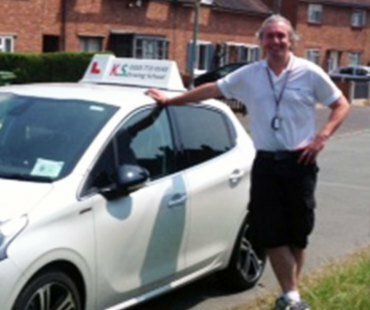 K.S.Driving School provides you with highly professional driving instruction throughout Shrewsbury, Telford, and surrounding areas. Instructors who consistently achieve high pass rates. Giving you the best chance of passing in a shorter time which saves you money! Driving School recognize students have busy schedules so the Instructors offer a door to door service. The Instructors will pick you up and drop you off at any convenient location. Driving lessons are in up to date cars using all of the latest training aids. Which make learning to drive simple and the Lessons are structured to the pupils the learning needs.Driving Lessons are on a one to one basis and a full hour is always given. In the unlikely event, you are not happy for any reason a refund of the lessons owing. Will be given the lessons given will be charged at the full price. No one else does. Meet the Team Local Instructors. We're always looking for Driving Instructors. We even offer Driving Instructor training! Please don't hesitate to get in touch and start your new career! Almost Half of All Learners in Shrewsbury fail their first driving test (official DVLA Stats 2014) This is a very poor reflection on the driving school industry and highlights the “hidden cost” of cheap lessons. You have to ask the question. Why do some driving schools or driving instructors sell themselves as the CHEAPEST in Shrewsbury. Driving School unable to sell lessons on reputation? Lack the essential training to provide quality tuition? Customer reviews to prove their reputation? Won’t offer two-hour lessons to maximize your learning. The Driving School only book from week to week. It’s ALL about what other students that have had the customer experience, have to say! Do your research and make your 1st driving test, your ONLY driving test.